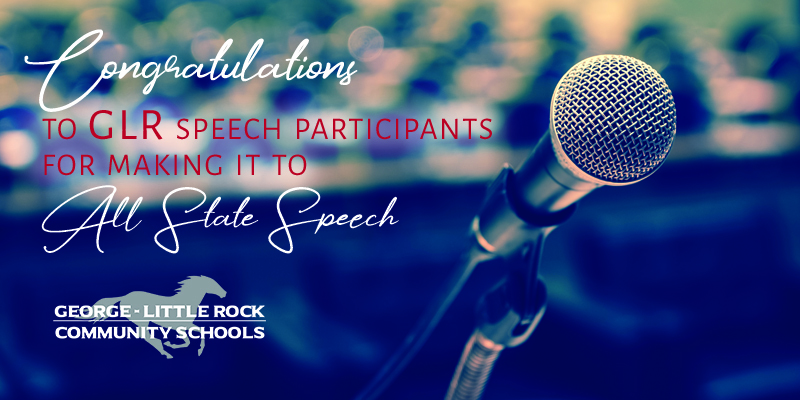 The George-Little Rock Speech team was honored with two recent All-State nominations. The Reader’s Theater, performing Elephant’s Graveyard by George Brant, tells the true story of the execution of an elephant (Mary) after she killed her rider. The small town of Erwin, Tenn., later hung Mary for her crime. It is the only known execution of an elephant. The performers, earning straight I’s at State, were thrilled with the nonperforming nomination. Only three Reader’s Theaters were selected to perform, so the nonperforming honor is wonderful. The Group Mime, consisting of Samantha Hellenga, Kali Johnson, Linda Lewi and Kailey Sprock, will be performing at All-State on February 16. The title of their mime is Unleash Your Voice and tackles the idea of what happens if you stay silent or if you allow someone else to silence you. It’s a powerful dramatic piece that is thought-provoking in this time of trying to be politically correct, yet sharing your voice through writing, art and photography. An All-State nomination is not a given. Just because a group may receive straight I’s (and GLR had four total at State contest) does not mean an All-State nomination is coming. Judges watch for an entry that surpasses “excellent,” and they independently (without conferring with each other) choose those groups that are outstanding. If a group manages to be placed on all three judges’ lists, then the list is ranked and the ranking will determine whether a group is performing or not. An All-State nomination – either performing or nonperforming – is a crowning achievement for any speech student. Congratulations to these 16 students and their coaches – Brenda M. Sandbulte, Tim Mauldin and Kendra Reitsma.